Glushko, Robert J. (Editor). The Discipline of Organizing. O'Reilly Media, 2014. Kent, William. 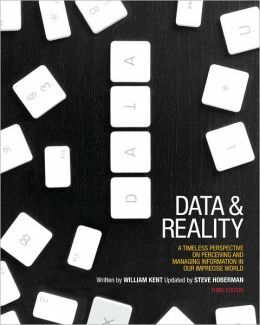 Data and Reality (3rd Edition). Technics Publications, 2012. Many of the non-textbook readings are behind paywalls, and can be accessed by setting up the UC Berkeley library proxy server on your browser. Just as the endnotes in TDO are tagged by disciplines (see the key below), we will tag our Recommended Readings by discipline to help you decide whether they'll be of interest to you. Recommended readings are chosen to give deeper, more domain-specific takes on the more abstract concepts you'll be learning, to help give them more grounding in your goals and interests – you don't HAVE to read any of them, but we're hoping you'll WANT to read at least a few of them over the course of the semester. We'll be adding more of them in the coming weeks, so keep an eye on this page. Bush, Vannevar. “As We May Think.” The Atlantic, 1945. Borges, Jorge Luis. “The library of Babel.” Collected Fictions, 1998. [Com] May, K.. TED Blog, 28 January 2014 The Moneyball Effect: How smart data is transforming criminal justice, healthcare, music, and even government spending. NPR. For a More Ordered Life, Organize Like a Chef, 2014. [Bus] Yuhanna, Noel. Enterprise Data Archiving. 2011. [Arc] Ball, Joan. Digitizing the Drawers. 2011. Gardiner, Bryan. “How an Army of Sensors Helps Us Track Tsunamis and Score Parking Spots.” Wired, 2013. [Business] Ng, Serena and Bensinger, Greg. “The Perils of Pooled Merchandise.” WSJ, 2014. [Museums] Olozia, J.. “An Infamous Forger on His Most Convincing Works, NY Times 18 September 2014. Lohr, Steve. “For Big-Data Scientists, ‘Janitor Work’ Is Key Hurdle to Insights.” NYT, 2014. Trant, Jennifer. “Studying social tagging and folksonomy: A review and framework.” Journal of Digital Information , 2009. Naumann, Felix and Herschel, Melanie. An Introduction to Duplicate Detection, 2010. Harpring, Patricia. “The language of images: enhancing access to images by applying metadata schemas and structured vocabularies.” Introduction to Art Image Access: Issues, Tools, Standards and Strategies, 2002. Cuno, James. “How art history is failing at the internet.” Daily Dot, 2012. Naaman, Mor, et al. “Context data in geo-referenced digital photo collections.” 2004. Castelluccio, Michael. “The Music Genome Project.” Strategic Finance, 2006. [Mus] Yang, Sarah. Help wanted: Public needed to uncover clues in natural history collections. UC Berkeley News Center, 2013. [Mus] [Com] Siegal, Nina. “Masterworks for One and All.” NYT, 2013. [Com] Christel, Michael. Automated Metadata in Multimedia Information Systems, 2009. [Com] MIT Technology Review. Deep Learning, 2014. [IA] Glushko, Robert. Modeling Methods and Artifacts for Crossing the Data/Document Divide, 2005. Krebs, Valdis. Social Network Analysis: A Brief Introduction. [Com] [LIS] Powell, James, et al. "Graphs in libraries: A primer." Information Technology and Libraries, 2011. Berners-Lee, Tim, et al. “The semantic web.” Scientific American, 2001. Heath, Tom and Bizer, Christian. “Linked data: Evolving the web into a global data space.” 2011. Chapters 1 and 2, pages 1-29. [LIS] Byrne, Gillian and Goddard, Lisa. “The Strongest Link: Libraries and Linked Data.” D-Lib Magazine, 2010. [CogSci][Linguistics] Boroditsky, Lera. “Lost in Translation.” WSJ, 2010. [CogSci] Glushko, Robert, et al. “Categorization in the wild.” Trends in cognitive sciences, 2008. Study Box 3. [Philosophy] [Linguistics] Borges, Jorge Luis. “The Analytical Language of John Wilkins .” 1937. Tavris, Carol. “How Psychiatry Went Crazy.” WSJ, 2013. Hoyt, Clark. “Semantic minefields.” NYT, 2010. Prewitt, Kenneth. “Fix the Census’ Archaic Racial Categories.” NYT, 2013. Rosenthal, Arnon, et al. “From semantic integration to semantics management: case studies and a way forward.” ACM SIGMOD Record, 2004. [CogSci ][IA] Norman, D. A. (2006). Logic versus usage: the case for activity-centered design. interactions, 13(6), 45-ff..
[Com] [IA] Hearst, Marti. Search User Interfaces, 2009. Section 8.6 "Faceted Navigation"
Glushko, R.J, and McGrath, T. "Describing what Businesses do and how they do it", Chapter 4 of Document Engineering (Sections 4.1-4.2, pages 101-127). [Com] [Bus] Glushko, R. J., & Nomorosa, K. J. (2013). "Substituting Information for Interaction: A Framework for Personalization in Service Encounters and Service Systems." Journal of Service Research, 16(1), 21-38. Glushko, R.J, and McGrath, T. "Describing what Businesses do and how they do it", (Section 4.4.2, pages 134-144). Baron, Richard, et al. “Electronic health records: just around the corner? Or over the cliff?” Annals of Internal Medicine, 2005. [Business] [Law] Farr, Christina. “Apple prepares Healthkit rollout amid tangled regulatory web.” Reuters, 2014. Hearst, Marti A. “‘Natural’ search user interfaces.” Communications of the ACM, 2011. Geller, Tom. “Talking to machines.” Communications of the ACM, 2012. Schmitz, Patrick and Black, Michael. “The Delphi Toolkit: Enabling Semantic Search for Museum Collections.” 2008. Michel, Jean-Baptiste, et al. “Quantitative analysis of culture using millions of digitized books.” Science, 2011. Greengard, Samuel. “Life, translated.” Communications of the ACM, 2011. Feldman, Ronen. “Techniques and applications for sentiment analysis.” Communications of the ACM, 2013. Juola, Patrick. “Rowling and ‘Galbraith’: an authorial analysis.” 2013. Hewes, Arlington. “Step aside Google image search, here’s an algorithm that knows what’s in a picture.” The Physics arXiv Blog. “When a machine learning algorithm studied fine art paintings, it saw things art historians had never noticed.” 2014.Singularity Hub, 2014. Bob's office hours are on Mondays from 12:00-12:30pm and 1:30-2:00pm. TA office hours are by appointment. Monday 10/20 Lecture Notes are Up! Lecture Notes for Monday 11/17 are up! Can a machine understand and organize art? When Is A Watch Like A Car? E-cigarettes: What are they anyway? 202 in the wild: should Twitter be algorithmically curated? Interesting articles about Yahoo shutting down its hierarchical directory of websites at the end of the year. what kind of girl is this girl? But what's your Erdös-Bacon-Sabbath number? 202 in the Wild Wild West: What is a gun? 202 In The Wild - Wearables: Medical Devices or Fitness Devices? Will anti-tag be on the exam? Literally 202 in the wild: Reclassifying bugs! 202 in the Wild: A Resident or Not? What should a Bayesian infer from the Antikythera Mechanism?